The Dallas Suzuki Academy offers a blend of Suzuki and traditional teaching methods for students age 4 through adult. The result is a tailoring of instruction that will meet the individual needs of each student according to their age, playing level, rate of progression, personality, and distinct way of learning. 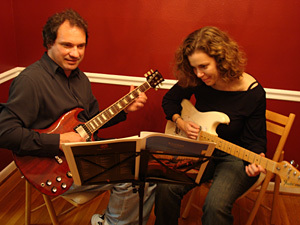 While focusing great attention on technique and proper fundamentals, our music teachers also encourage each student to create and develop their own unique playing style. 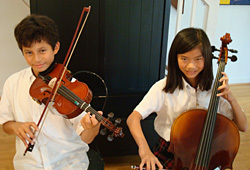 The Suzuki method is aimed at the younger student. It emphasizes listening to music, memorizing songs and pieces, observing and imitating the instructor's playing movements, singing melodies, clapping rhythms, participating in group classes, and nurturing the belief that there is joy in learning music, both for the student and parent. The child also learns the valuable tools of discipline, dedication and perseverance through the daily practicing routine and periodic performances. The parental role is of particular importance, as he/she will be asked to learn many of the technical and musical elements of the instrument along with the child. This will enable the parent to oversee, guide and encourage the desire to learn in the home practice sessions. 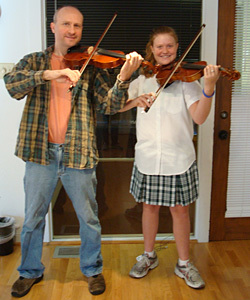 This teacher-student-parent interaction is vital to the progress of the young musician. There is a natural progression from the Suzuki method to the traditional method of teaching. While the Suzuki approach is emphasized with the younger beginning student, note-reading and other traditional elements are quickly added in, ensuring that the child does not learn to play only by ear. 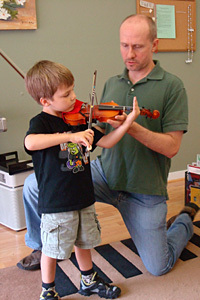 Depending on age, some students will not start with the Suzuki method. Once proper body mechanics (posture and form) are established, the older beginner may immediately transition into traditional instruction. In addition to emphasizing note-reading, traditional instruction components include studying scales, exercises and etudes, sight-reading, and theory training. These more traditional tools help to greatly improve a student's technique and playing foundation, thereby facilitating faster and more productive progress as the student advances to learning more difficult music. Once the students are prepared, we encourage them to join their school orchestras, or to audition for one of the high-level Dallas-area youth symphonies. Several of our current and former students have held section and titled positions with the Greater Dallas Youth Orchestra, the New Conservatory of Dallas, school, all-city, all-region and all-state orchestras. Additionally, many of our students have received highest ratings at the U.I.L. solo and ensemble competitions. The repertoire used by DSA teachers includes solos and technical works for all playing levels, with chamber and orchestral music added in as students advance. Suzuki and traditional solo pieces are intermixed, and supplemented by many technical studies, such as scales, exercises, etudes, etc. The Suzuki books are compilations of works which help a student progress systematically from beginning to intermediate and advanced playing levels. The books begin with folk tunes and Dr. Shinichi Suzuki's compositions, and continue with simple and then progressively more difficult classical pieces, including those of Bach, Beethoven, Vivaldi, Mozart and others. As students progress, many other classical pieces are added in order to further expand the repertoire. For interested intermediate and advanced students, chamber group opportunities (duos, trios and quartets) can be arranged at the DSA. Students who have joined orchestras are encouraged to bring those pieces to lessons for instruction. In addition to the classical works, alternative ("fun") pieces are often offered---popular, rock, country, movie themes, etc. ---for students who are interested in expanding their range of musical styles. For guitar students, we offer a program of study for both acoustic and electric guitar with the primary emphasis being on blues and pop & rock. Classical guitar lessons are also offered.